From Gund. 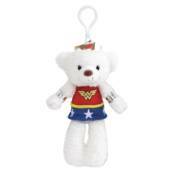 Make your purse, bag, backpack, or car mirror really super with this adorable DC Comics Wonder Woman Clip-On Backpack Plush featuring a soft and fuzzy incarnation of Wonder Woman, complete with crown! Made of a polyester blend, it measures about 6 1/2-inches tall x 3 1/2-inches wide x 2-inches long.